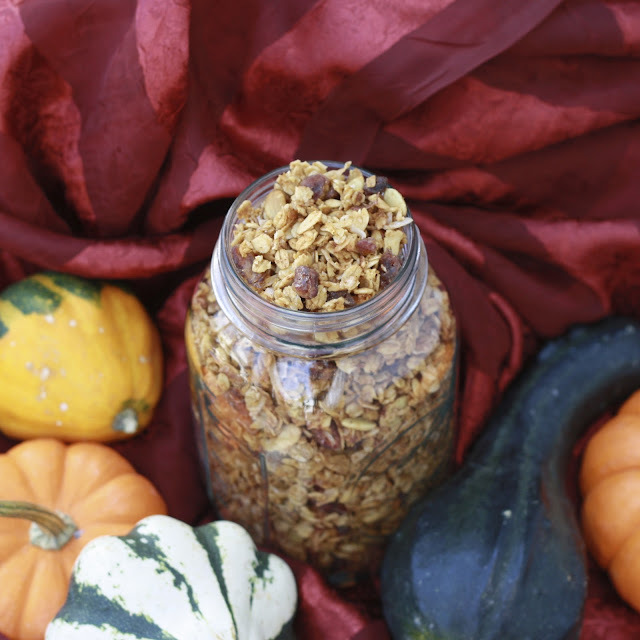 I've made pumpkin granola once before, but when my grandma mailed me some newspaper clippings from the Milwaukee Journal Sentinel, I was reminded how much I loved the stuff and decided to try a new version. As luck would have it, the recipe called for mixing in dried dates, which I had recently picked up from the grocery store with no plan in mind for them. The good luck ended there. The evening I made this granola can only be described as disastrous! First I spilled coconut oil all down the front of my dress and all over the kitchen floor. Have you ever tried to clean oil up off the floor? Not fun! Disaster #1. I was simultaneously cooking dinner while prepping this granola and then spilled cayenne pepper all over my stovetop. Sigh. Disaster #2. And because disasters apparently come in threes, I had the brilliant idea to transfer my newly purchased bag of popcorn kernels into a Ziploc bag...except I somehow missed the bag and they ended up all over the floor. Disaster #3. Yes, that would be popcorn kernels all over my floor ALREADY slicked with oil. Thank God for my husband, who silently shook his head and went to get the broom. At the end of the day, a disastrous hour in the kitchen was well worth it. 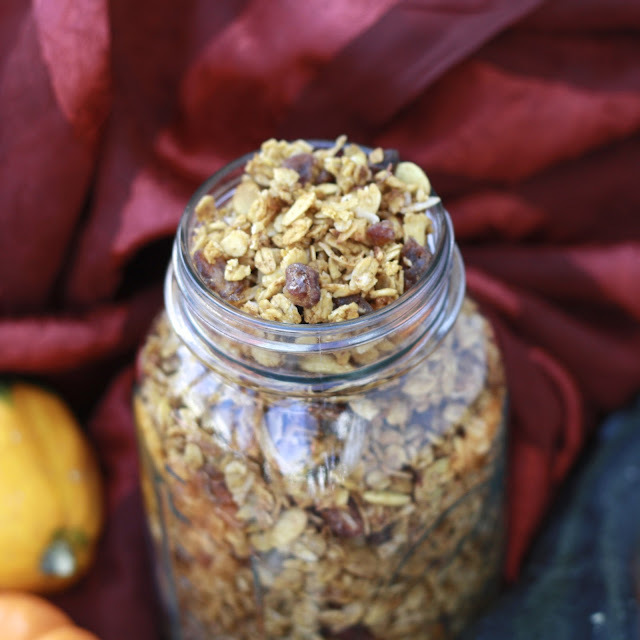 I think I liked this granola better than the last pumpkin granola. It was a little chewier than I would have preferred, but that could be prevented by baking the granola on two cookie sheets instead of one, which I've reflected in the instructions below. Make your breakfast a little more fall-like with some of this! I enjoyed it with milk, yogurt, and just by the handful! If you don't like dates, add raisins or dried cranberries instead! 1. Combine oats, pepitas, and coconut in a large bowl. In a separate small bowl, whisk together oil, honey, pumpkin pie spice, salt, vanilla, molasses, and pumpkin puree. 2. Toss liquid mixture with dry ingredients, stirring to evenly coat. Spread mixture evenly on two rimmed cookie sheets lined with parchment paper. 3. Preheat oven to 325F. 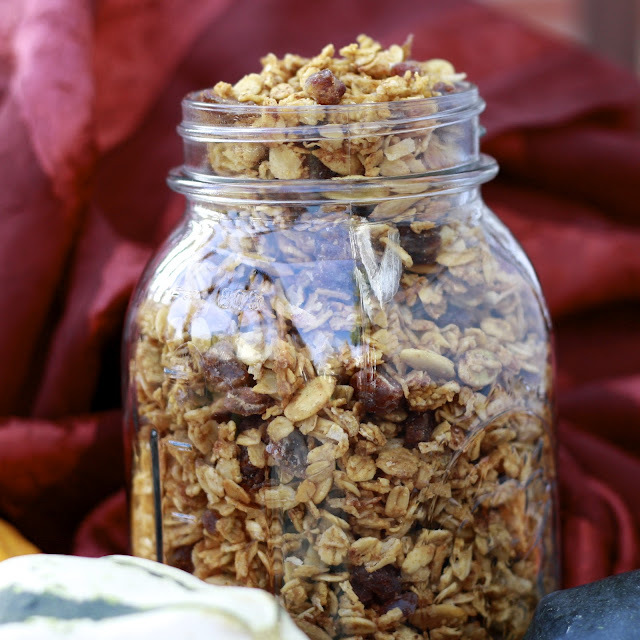 Bake granola for 25-30 minutes, until lightly golden brown. Stir every 10 minutes. 4. Remove from oven and stir in chopped dates. Allow mixture to completely cool before storing in an airtight container.